Some of the most common dental problems involve broken, decayed, and missing teeth, but at Ridgepointe Dental, we’ve been able to rebuild thousands of smiles using tried and true treatments like dental crowns and bridges. A dental crown is a tooth-shaped restoration that can be used to enhance a tooth cosmetically or reinforce it structurally, and it simply fits over the top of a damaged tooth. It fully encapsulates the tooth in order to help protect it from further decay or trauma, and we always make sure that it seamlessly blends into a patient’s smile. By holding pieces of a broken tooth together and capping them for improved structure. Restoring broken or worn teeth from damage. Restoring severely decayed teeth to healthy, strong teeth. Covering discolored teeth for a beautiful makeover. Anchoring a series of dental crowns, creating a durable dental bridge. In the case of a single missing tooth or a few in a row, a dental bridge is an excellent way to replace them and prevent a patient’s teeth from naturally shifting into the gap. A bridge is composed of prosthetic teeth that are attached to dental crowns placed on either side of the space in a person’s smile. 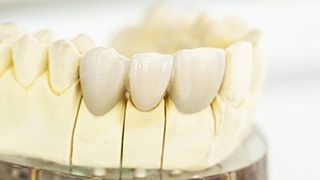 Why Might You Need a Dental Bridge? They have two or more missing teeth that are right next to each other. They have dental damage that is affecting two or more teeth next to each other, enough to replace them. They don’t have adequate enough jaw bone density to use dental implants to replace teeth. One of the most important things to remember about getting dental restorations is that your dentist needs to plan and prepare your perfect restorations. It starts with a dental consultation to evaluate the state of your teeth, then your dentist will also determine the cause for your dental issue. Sometimes, this can affect the type of restoration that will provide the longest stability. Secondly, your dentist will measure the affected area and take impressions. These details will be sent to a nearby dental lab to have your dental restorations crafted especially for you. We won’t let you leave our office empty handed either. We’ll provide a temporary restoration to address your dental issue while your permanent restorations are being created. Once you’ve had your tooth restored with a gorgeous crown or bridge from our office, it’s highly important for you to maintain excellent oral hygiene with the help of your local dentist. You’ll need to continue brushing twice a day for two minutes a day, floss, and be sure to visit your dentist regularly. This way, we’re able to address any concerns if any should arise and professionally clean your teeth—new and restored. Both of these restorations take at least two visits to be designed, made, and placed, and with the proper care, they can often last for 10 years or more. If you have a cracked tooth, cavity, or some missing, contact us today for an appointment and we’ll have exactly what you need.